Fife Flyers had to settle for two points from their weekend on the road. 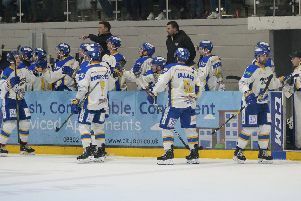 The team won 4-2 against MK Lightning, but went down to a 4-1 defeat at Coventry Blaze last night. 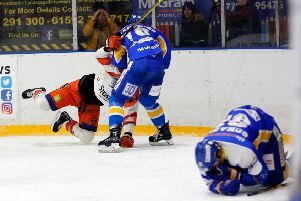 The results kept Flyers in seventh place in the EIHL – one of six teams chasing the last four remaining play-off spots. They are just one point off fifth placed Guildford Flames and tied with struggling Sheffield Steelers who are sixth, with games in hand over them too. Crucially, Flyers have a five-point cushion on Manchester Storm, and a game in hand. Coventry and Dundee Stars are on the wrong side of the red line, but the gap is so tight they both still have a good shot at stealing of the berths. Four of the post-season play-off spots have already been secured – Cardiff Devils, Bel;fast Giants, Nottingham Panthers and Glasgow Clan are all safely into the final stage of the 2018-19 season. Flyers return to home ice for a double header weekend. They host Guildford on Saturday, and Nottingham on Sunday.